Play as Simba, the future king of the Lions as he fights to reclaim his kingdom from his evil uncle Scar who killed his father. 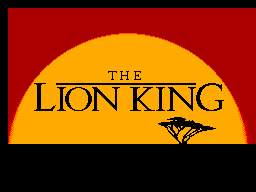 The game follows the plot of the movie with Simba starting off as a cub and then growing as the game progresses. Published by Disney and Virgin, the game was developed by UK-based Syrox Developments and released in 1994 in PAL regions only. The game is well known to most "complete collectors" for having a plethora of regionalized box art. The main game itself is an action-platformer. You guide Simba to the end of various levels, overcoming obstacles and enemies as you go with occasional boss battles to finish. You have a growl and a claw attack which can stun and kill some of the weaker enemies. 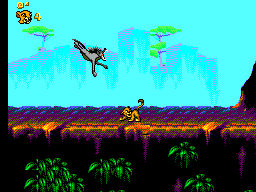 The growl can also be used to interact with other animals such as changing the direction of monkeys hanging in trees which will hurl you across the level. While the emphasis isn't on collecting items such as in a Sonic game, there are things here and there to keep an eye out for. These include extra lives in the form of a small Simba painting, continues and a diamond which unlocks the bonus stage where you play as Pumba trying to eat as many melon seeds as you can while avoiding the bugs. It's Disney so you know the animation is going to be top quality. Character animation is very smooth and detailed. It really shows off what programmers could do with Sega's great 8-bit machine in the final days of its life. 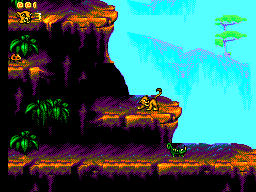 A trade-off for this however is that some of the scenery has a bleached out look to it but its not overly jarring and you will be concentrating more on Simba and the enemy sprites anyway so its not that big of an issue. It's just worth mentioning here. The Wildebeest in the stampede section do look like cardboard cutouts as they scroll however. Again, Disney games are well known for having good music and this is no exception. Inspired by tracks from the movie, the Master System sound chip earns its pay delivering the music here. If you are going to compare it to the Mega Drive version then obviously its going to sound a little ping-y but for the Master System its definitely up there with the best for me. The rendition of "I just can't wait to be king" will be stuck in your head for hours afterwards. Nice and tight. Just how I like them. Simba has a distinct feel to him through the control pad which gives the game a certain uniqueness amongst its contemporaries. A really nice touch is that Simba gains abilities as he gets older which makes sense but does require practice to master the button combinations to achieve them. Definitely a high score here. The gameplay is fun and challenging making completion feel earned and rewarding. Any Master System night has time for The Lion King. This game doesn't seem as well remembered as some of Disney's other titles on the console such as Castle of Illusion or The Lucky Dime Caper and this is a shame. I think its late arrival in the console's life didn't help matters since even the Mega Drive was well in to middle age at this point (Hell the Playstation 1 was a year away!). Nevertheless it appeals to the Master System enthusiast now and if you play this after - say - Alex Kidd, you get to see just how far programmers for the console had gone during its lifetime. Check it out yourself, you won't be disappointed, just don't pay through the nose for it. I got mine complete in box for just �5 (US $7.07 in early 2018) which was an absolute steal but on Ebay the prices vary between �6-�7 for good boxed copies. However, there are chancers out there listing it for over twice that so shop around.